Madison Community Services, Inc is blessed to have amazing volunteers. Our 2015 Food Basket Program, run by Margaret Diglio with the help of her wonderful husband Vinny, was once again a huge success. We couldn’t do it without the help of the community and I would like to extend some well deserved thank-you’s. A BIG thank you for sponsoring our 2015 Holiday Food Basket Program on behalf of the Baldwin Fund. Who generously provide books to every child with families eligible for our food baskets. This can be anywhere from 50 to 90 kids and is done three times a year! Thanks to Melanie Hartman’s Confirmation Class and other community members the assembly of our Easter baskets went smoothly and quickly! 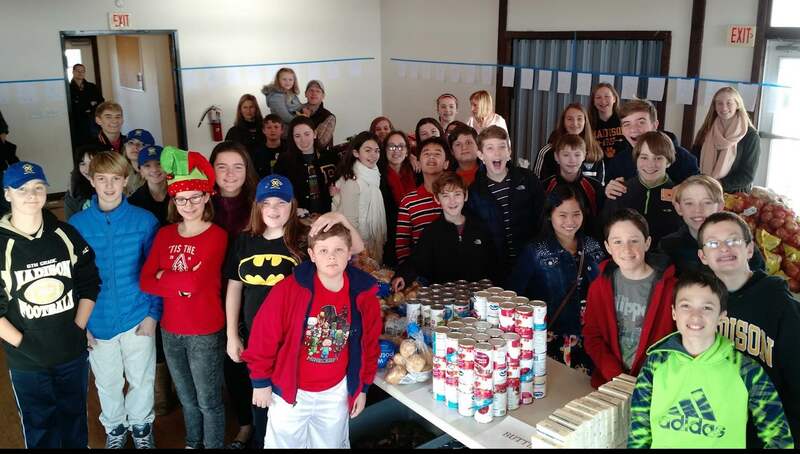 To the Boy Scouts for dedicating their annual food drive to our Thanksgiving baskets, the DHHS Sports Teams and the Madison Newcomers Club for helping to assemble them. To the Madison Police Department for providing the turkeys for our Christmas baskets, the Madison Exchange and Excel Clubs for their help in assembling the baskets, to Lucille Przygocki for providing stuffed bears for the families with small children; and again, to the MPD officers who lent their assistance in the delivery process. Thank you to the Girl Scouts for baking delicious cookies for our Thanksgiving and Christmas baskets. That homemade touch is very special! To the Madison Beach & Rec Department for allowing us to use the Surf Club as our distribution center throughout the year; to Guilford Big Y for giving us a generous 20% discount on our purchases; and to the many drivers who arrive every Monday before the holiday to help us deliver the baskets to the seniors and families who need them. It is very heartwarming to see the outpouring of compassion for the less fortunate. On behalf of the MCS Board of Directors, you all have my heartfelt thanks.